Mayra Rocha Sandoval, Mexico City, July 2013. Photo by Harald Molina. Although students of Lama Zopa Rinpoche have successfully completed three-year deity retreats, having a student finish a three-year lam-rim retreat is extremely rare. As Rinpoche emphasizes the lam-rim as the foundation for achieving enlightenment, Mandala rejoices in the accomplishment of long-time student Mayra Rocha Sandoval, who carried out a three-year lam-rim retreat on the advice of Rinpoche in her home in bustling Mexico City. Mayra wrapped up the retreat in March 2013. Mandala: How did you come to decide to do a three-year lam-rim retreat? And how did your family and friends react? Mayra: The decision to do the lam-rim retreat arose in April 2008 during our dear teacher Lama Zopa Rinpoche’s visit to Mexico. In an interview, I asked Rinpoche to please help me make this life really meaningful. Rinpoche checked [by divination] and told me that it would be very good to do a three-year lam-rim retreat. When I asked him where to do it, he responded, “In Mexico, in your house.”My house is right in the center of Mexico City, a rather noisy place and with many challenges. My family and friends were very surprised upon hearing the news. Mandala: What preparations did you have to make before you began? 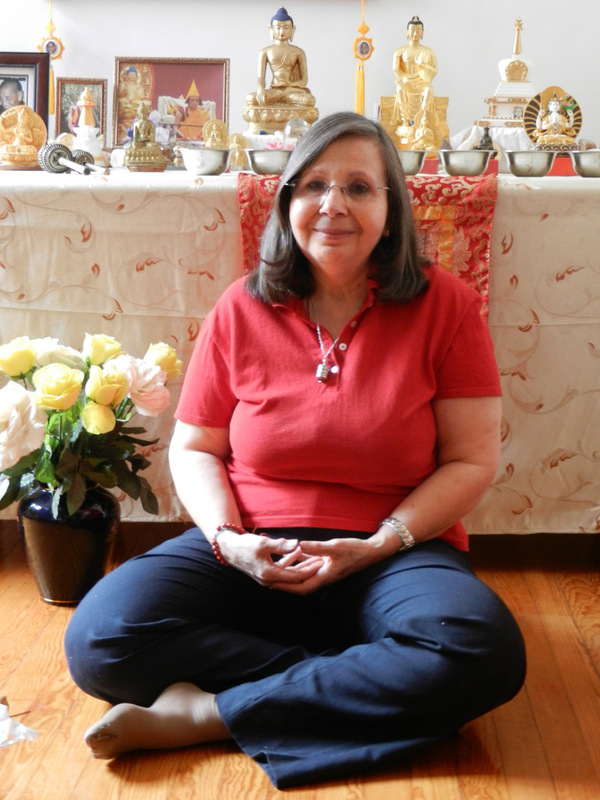 Mayra: In May 2009 during the 100 Million Mani Retreat at Institut Vajra Yogini in France, I received Rinpoche’s instructions for the retreat. The main preparations indicated were some preliminary practices: 100,000 tsa-tsas and 30,000 Dorje Khadro fire pujas, which I completed at Nalanda Monastery that same year. I returned to Mexico to set up my small gompa and prepare the apartment for the retreat. A month before I planned to begin the retreat, however, I had a car accident on the road in Aguascalientes when I was going to some teachings. Fortunately, I had only minor injuries and a nervous breakdown that only delayed the beginning of the retreat a little.